Martin has been a major presence in Wyncote Audubon Society for many years. His many contributions to the club have included: President for seven years, Vice President, Treasurer for six years, Edward Hicks Parry Award Recipient, Field Trip Chair for ten years, Conservation Chair, Christmas Bird Count Chair for ten years. 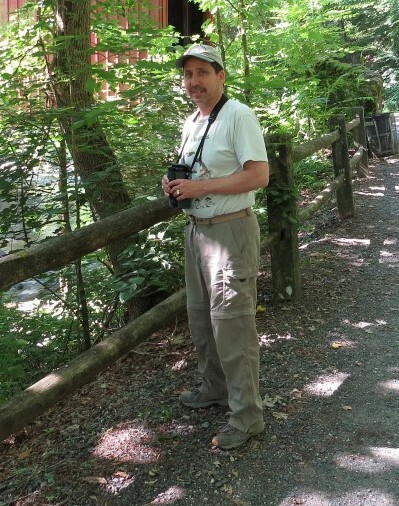 He has given travel presentations at Delaware Valley Ornithological Club, WAS, and West Chester Bird Club. in this pursuit include the Germantown Friends School Craft Fair, Bucks County Audubon Craft show, and other crafts fairs. His art works include photographs by Kevin Karlson and Sam Fried and ceramics by Peg Ridgely. His first piece is a feather carving, bought in Easton. The collection is very impressive. Martin began birding as a youngster and was lucky enough to be driven around by his beloved aunt, Tommy Childs. Later on, he and she birded Iceland when he had graduated from Lehigh. Since then Martin has birded extensively on five continents: Australia, Africa, Europe, and North and South America. He has birded 22 countries, 8 Canadian provinces and 28 of the 50 states. A 28+ year in the pharmaceutical industry R&D area has afforded Martin travel opportunities to expand his life list with trips to the United Kingdom, Spain and Australia as well the means to complete his other travels. “Favorite birds?” I asked. Shorebirds in general along with raptors and spectacles like the Sandhill Crane gathering along the Platte River in Nebraska. One can also infer from his license plate that he is a fan of all jacamars. In between trips he leads field trips for Wyncote Audubon Society to hot spots in Pennsylvania, Delaware, and New Jersey. Some of his most popular destinations have been Cape May and Belleplain in New Jersey, and White Clay Creek and Brandywine in Delaware. Beyond field trips for WAS, Martin leads bird walks for Tookany-Tacony/Frankford Watershed Partnership (TTF-WP), DVOC and Bird Philly. He is a member of ABA, DOS and a life member of DVOC. He and I have co-authored three articles for Bird Watcher’s Digest: Coastal Massachusetts, the Dempster Highway in the Northwest Territory, and Niagara Falls. We finished up our morning on Forbidden Drive in Fairmount Park, where we saw and heard several nesting birds including Acadian Flycatcher, Veery, Wood Thrush, Eastern Towhee, Carolina and House Wrens, Carolina Chickadee, White-breasted Nuthatch. When Martin isn’t out birding he attends Philadelphia Orchestra concerts with his sister Nancy, as well as Phillies and Flyers games with friends and family. He also spends quality time with his brother and sister-in-law, and various nephews and nieces and one grand-niece. A busy, fruitful life.